At the center of the resort, the Art of Animation Finding Nemo area makes you feel like you are swimming along the ocean floor with the sea grasses. Like a character in the movie you can swim with the adorable Disney fish in the largest pool on Walt Disney World property. New Disney family suites can accommodate parties of up to six people. 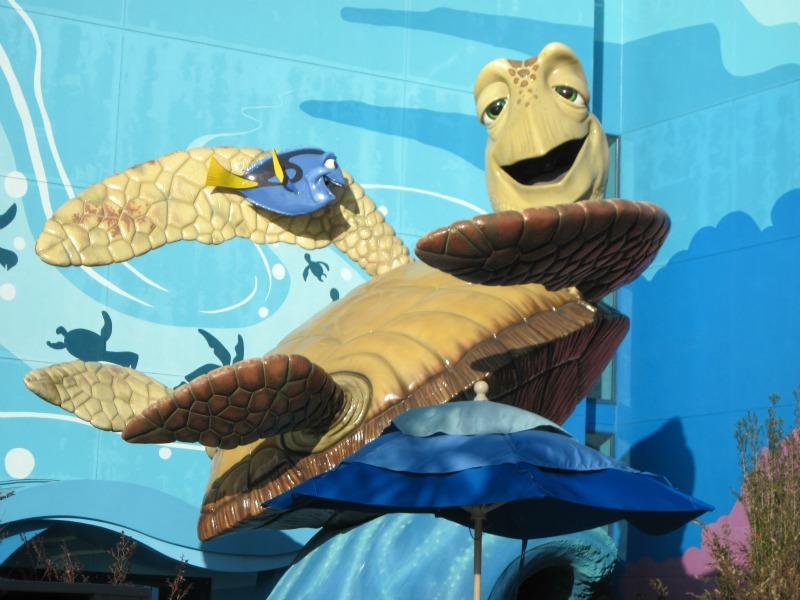 The resort is loaded with huge images from the movie, boasting a larger-than-life turtle, Crush, swimming with colorful fish by the pool. Images of fish painted on the pale blue buildings of the courtyard area serve as a backdrop to pull you into the story. 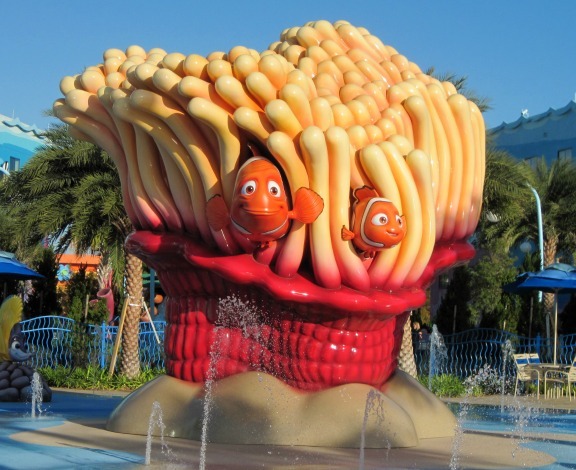 A large display with Nemo and his dad swimming through a coral-type plant is near the pool. Dory and Mr. Ray also make an appearance. 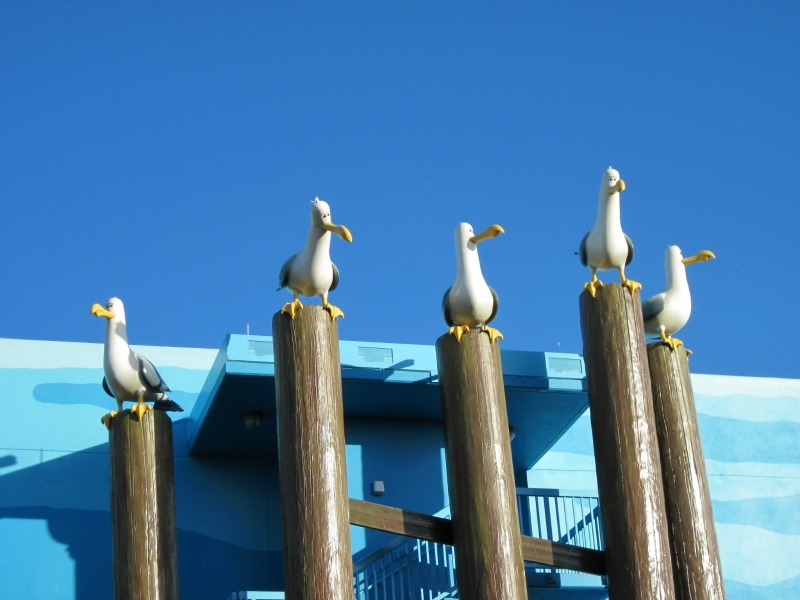 Seagulls perched atop pilings up high on the buildings call out "Mine! Mine! Mine! ", adding to the fun. The Finding Nemo buildings host Disney's new family suites in two buildings. The suites offer a roomy 565 square feet of living space. The living room has a flat screen television and a pullout sofa that converts to a double bed. The kitchette has a microwave, sink and mini-fridge. A queen size bed is in the bedroom. Rooms are decorated in pretty shades of blue, green, mauve and orange. The carpeting has a wavy pattern resembling water. The showers have dark tile with an eye-catching shark shower curtain in one of the bathrooms. 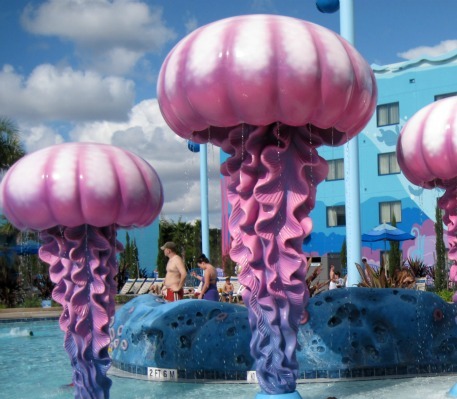 Welcome to the largest pool on Disney property! The Big Blue Pool is very impressive. With 308,527 gallons of water, it is huge! The pretty blue water is surrounded by beautifully painted buildings and swimming jellyfish. 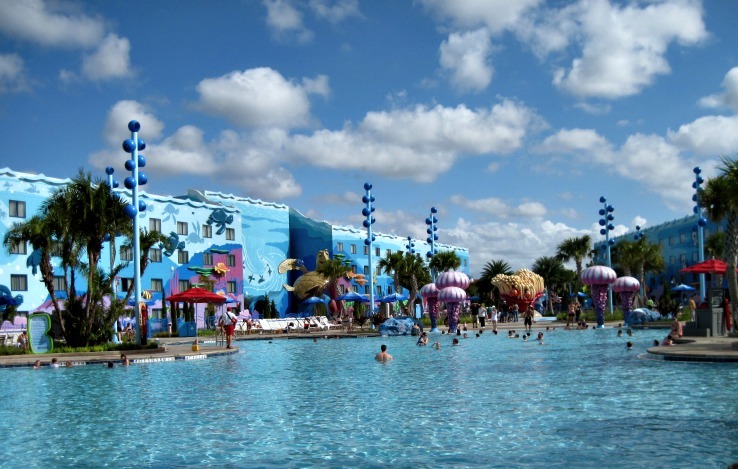 The Big Blue Pool has the only underwater audio system at Disney World. The pool features a zero entry section which is nice for the little kids. A toddler water play area with small sea creatures, including sea horses, is located next to the big pool. A simple, but visually appealing, playground with a slide is in the courtyard area. The playgrounds are colorful and very cute, but also very basic. The area is beautifully lit at night with tall lights surrounding the pool. This is the louder, busier pool at the resort, with a host of organized activities throughout the day.